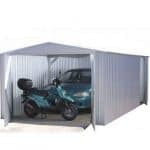 This double doored storage garage is designed to offer the ultimate all weather protection to a motorcycle, but it has an interior that’s spacious enough to be used for much more as well. Integrated vents mean that the interior feels cool and fresh even on a hot day, and there’s enough room to stand up in. 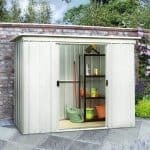 That means that we can imagine this building being used as a strong garden shed or even for workshop purposes. Whatever use the owner puts it to, the contents are sure to remain dry even when it’s raining or snowing outside. The first line of defence against the weather is the pent roof, and this is more than ably assisted by the overlap style cladding below it. This carries rainwater harmlessly away, and because it’s PVC coated you won’t have to worry about rust forming. So confident are the manufacturers of this, that they’ve provided a 25 year warranty against that occurrence. There are also no worries about security thanks to the window free design, which we always feel can act as a deterrent to opportune thieves who are looking for an easy target, and the key operated locking system which it was good to see is included as standard. 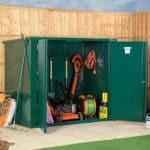 We’ve reviewed a number of motorcycle garages, and we’re always struck by just how versatile they are. This is a fine example, as it’s very well built and very weather resistant, which is of course essential as its primary function is to keep a metal vehicle away from the possible corrosive effects of moisture. 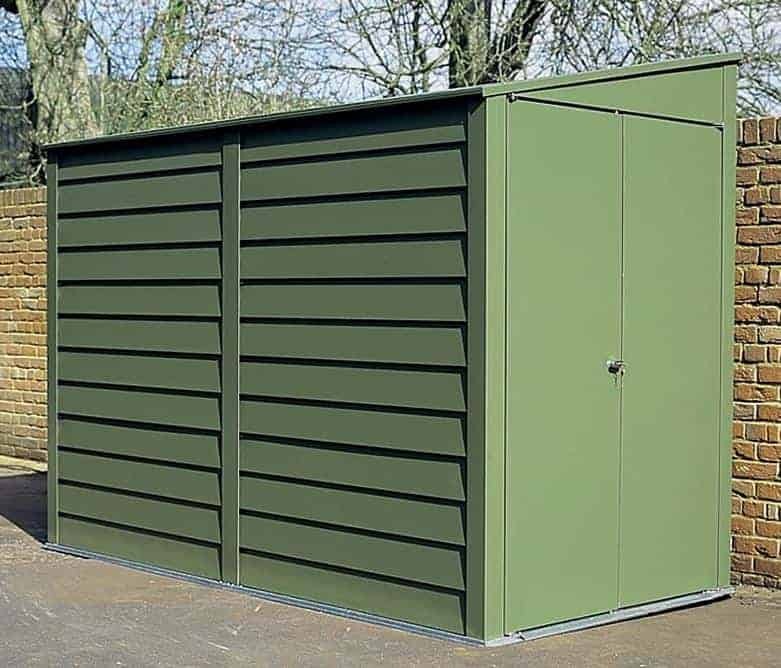 Finished in an attractive green colour scheme, we feel it could also make a very good small garden shed, and its vertical height means that it could fit even the tallest garden tools and implements inside. This height is helped by the pent roof, which also helps to keep water out of the interior by sliding it away rather than allowing it to sit on the surface. The peak height it gives is 2.04m and the eaves height is 1.74m, which is more than enough to accommodate a person pushing a motorcycle. The overall depth is a very accommodating 2.65m and the overall width is 1.60m which puts it firmly in the mid-range of the motorcycle garages that we’ve reviewed. The heart of this garage’s cladding is made of galvanised steel which itself is a tough and reliable substrate, so we were pleased to see that this was given even greater protection thanks to the addition of a PVC coating. This not only gives it the attractive green colour scheme, it also makes it even more fire retardant and stops water from getting to the metal itself. There is no floor supplied as standard, although one can be added as an optional extra, so you’ll need to have a suitably sized area of concrete that’s completely level on which to affix this building. A large, flat area of paving or patio can be used as an alternative. Most motorcyclists want to spend time out on the open road rather than painting or treating their garage, so they’ll be glad to hear that there are no treatment requirements for this building. We were just as pleased to see that there is a 25 year warranty provided by the manufacturer, guaranteeing the structure against the appearance of perforations caused by rust during this time. 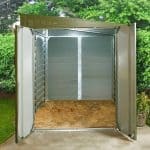 It’s a very long and therefore very reassuring warranty period, especially as we often review metal buildings that come with only five or ten year warranties. 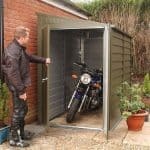 The doors are all important to a motorcycle garage, as after all the owner won’t want to risk catching their motorbike on the sides while manoeuvring it in. That’s why it was good to see that there are double hinged doors rather than a single one on this occasion, and that they open to a width of 1.39m. 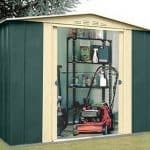 This is greater than we often see, and makes it much easier to get either a motorcycle inside, or wide tools and equipment if it’s being used as a garden storage space. There are no windows, but there are ventilation panels which come in very useful in the fight against condensation. Don’t look on the lack of windows as a negative, as we feel that this is a handy security feature, meaning that potential thieves are less likely to try to break in because they won’t know if anything valuable is kept inside. We were also pleased to see that a key operated lock is included as standard, and that further to this a hasp and padlock and an infrared burglar alarm system can be added as relatively low cost optional extras. 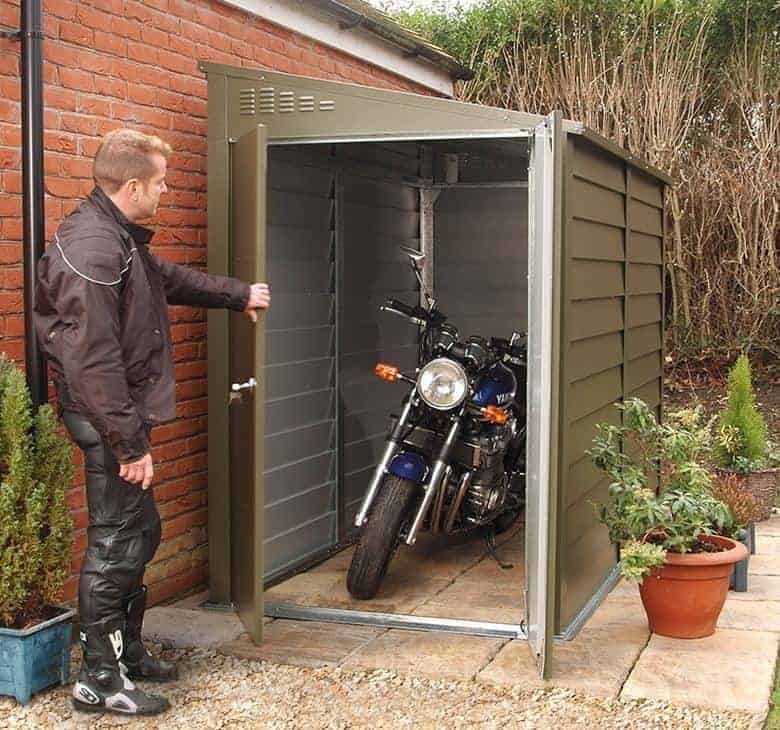 As well as the security features mentioned above, which we feel could prove to be very popular for owners of especially valuable vehicles, there are two further extras which are particularly aimed at those who are going to use this building for purposes other than motorbike storage. The first of these is a wooden floor, priced at £89.99. Whilst concrete is an ideal surface to store a motorcycle on thanks to its strength and durability, a wooden floor is perfect for walking on as it adds insulation and won’t suffer from dusting. Further to this, a wooden workbench is available, although this isn’t the cheapest optional extra at £94.99. Trimetals are experts when it comes to the fabrication of motorcycle garages, so we weren’t surprised to see high quality components used throughout. 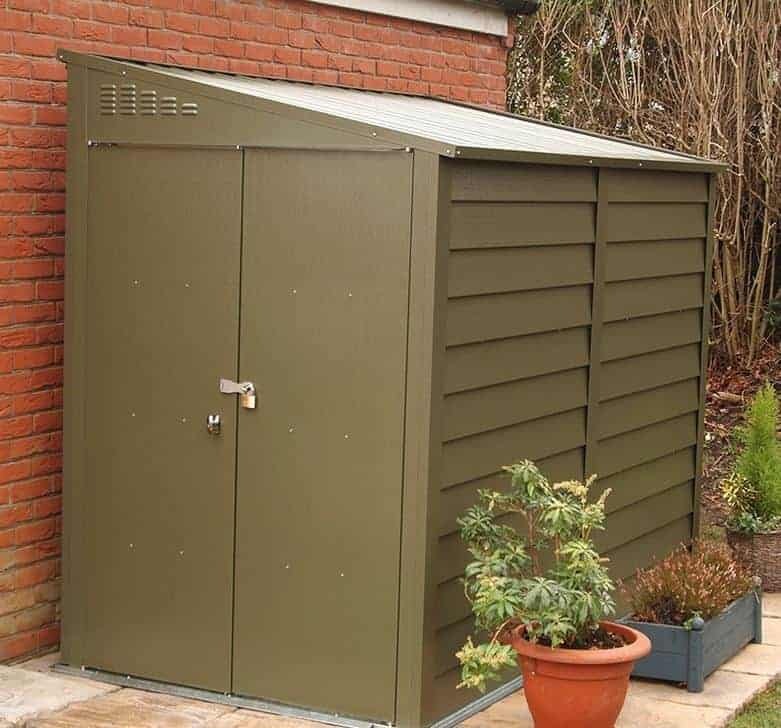 Galvanised steel and its PVC coating are both very durable materials, and the 25 year warranty against rust is a good indication of just how tough this building is. 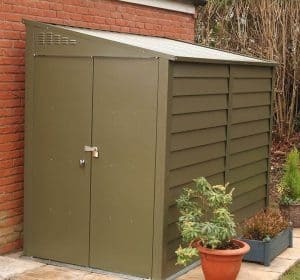 This is a mid sized motorcycle garage, and yet we feel it still has enough room to make it a useful garden storage facility as well. The instructions could be a little clearer, for example we feel that the drawings could have gone into more detail. With a friend’s help, however, you can still complete the installation in around five to seven hours. We found very little fault with the garage itself, but the price point of over a thousand pounds may put some potential buyers off. 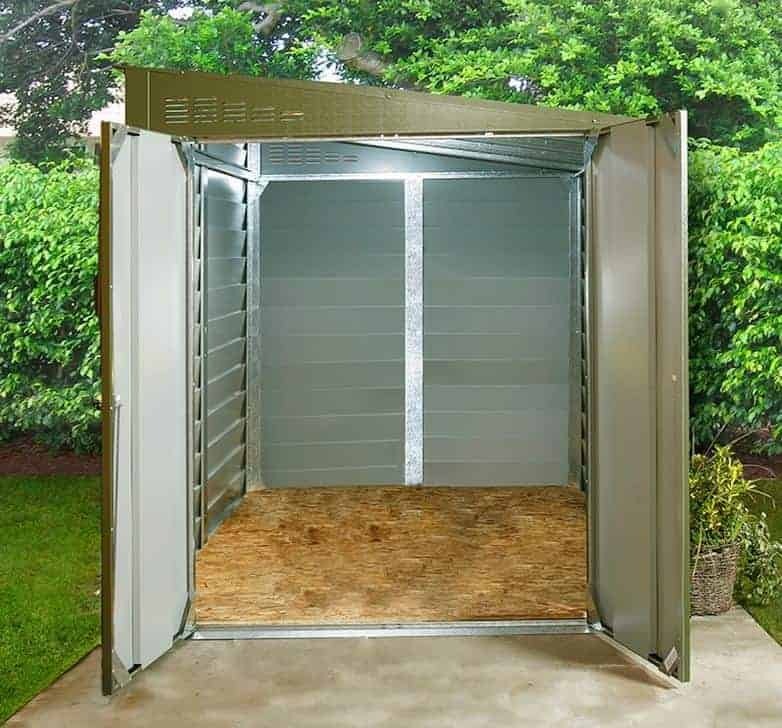 Final Thoughts: If you’re looking for a high quality and long lasting facility in which to store your motorcycle, and your budget will stretch to over a thousand pounds, then this is certainly well worth looking at. More than wide enough to take a standard motorcycle, it’s also very secure thanks to its window free design and its key operated lock that can be further enhanced with an optional hasp and padlock system. 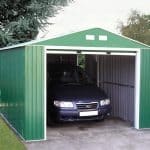 It looks like a metal pent shed, which is no bad thing as that again can deflect the attention of potential thieves. With tough and weather resistant cladding as well, we were impressed by this building’s features, whether it’s to be used for storing tools or a vehicle. We are leasing a property that has this on the drive. It is about 3 years old and the owner wants to sell it. 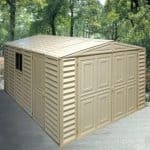 We are using it for storage at the moment and may purchase it if the price is right. Thoughts on a realistic price for it. My husband has said a bit of welding may have to be down and some screws replaced. has not really been looked after.